All Geeks Rejoice: Reverse Dungeoneering #8 A party of Dungeon Masters? Reverse Dungeoneering #8 A party of Dungeon Masters? 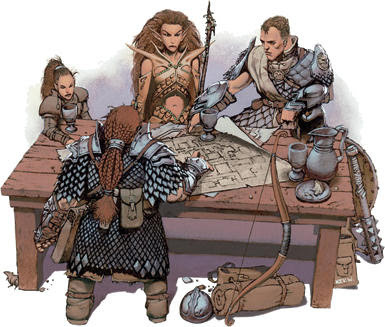 Something to test out in a future campaign: splitting up Dungeon Master duties among the entire group. It may sound crazy (and I’ll admit it kind of is) but it’s easier than you’d think. There are a thousand ways to pull this off so let’s take it in steps. Step 1) Start things off by all agreeing on a concept (or maybe let the dice decide). What kind of campaign will it be? Is it going to be in a particular campaign setting? Figure out the groundwork first. Step 2) Split up the storytelling. Are you going to take turns between sessions and just DM on the fly? Are you going to each plan out a major story arc? Maybe you have an egg timer and you pass the torch each time it sets off? There are plenty of ways to go about this but solve which method your group would prefer. Step 3) Pick which tasks you want. One person can take care of the geography and maps. The next can take care of keeping track of status effects and initiative. Another can handle tiles and monster HP. Maybe someone can take care of inventory, rewards, or whatever else you want to split? Step 4) Last but not least, you should make a group of characters together. You’ll all be players and Dungeon Masters simultaneously in this campaign. So try this out and let me know what you think in the comment section below. This is Kylak signing out as the ball's in your court now.